This new form of Greninja is circulating around. I am not following the anime or the movies so please try to be gentle if it was obvious. What exactly is this Greninja? If it's a mega-evolution, how did it get there without a stone? How exactly does his powers/abilities/skills vary from other normal Greninja? I know the physical difference, that it starts to resemble Ash a bit. Easily noticeable is the red middle part on his head instead of the body blue. Basically, what happens is that the bond between Ash and Greninja is so strong that Greninja took the new form as Ash-Greninja where Greninja takes some features of Ash (as you mentioned) and it is not a mega evolution. Some theorists say that it might be synchro evolution from the pokemon spin off Pokemon Reburst. 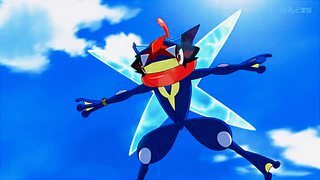 By turning into this form, Greninja's power greatly increases and as you can see on its back, there is a giant shuriken which is a replacement for water shuriken (the move). The Ash-Greninja form can only last for a short period of time before Ash and Greninja gets tired and faint, during the form ash can also feel the pain that Greninja is feeling. 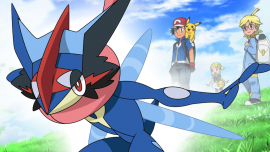 The official website explanation is "Ash's Greninja takes on a mysterious new appearance in the latest season! Ash-Greninja is the form that Greninja takes when the bond between it and Ash is raised to the limit. The strength of their bond changes Greninja's appearance, and it takes on the characteristic look of Ash's attire. This phenomenon is also said to have happened just once several hundred years ago in the Kalos region, but it remains shrouded in mystery." The anime explanation is saying pretty much the same thing. When it first happened in the ninja village, the anime explained that because the bond between is great, he has taken a new form. The first appearance looked something like this. during this stage, Stallone did a lot of testing where he discovered that this transformation will take place only when Greninja and Ash have mentally synchronized. 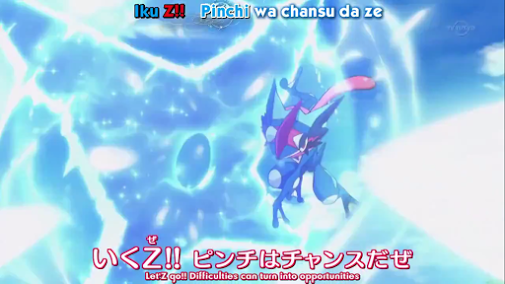 Then later in episode 25, while versing the kalos champion, Ash-Greninja got the full form and it looked like this. it was then explained that this was when the bond became maximum level where they are completely synchronized. And then it goes through the phases of difficulty between Ash Greninja and stuff. Everything about Ash-Greninja is explained in the anime, it also shows Stallone testing how it works and the road to master this form. I highly recommend Pokemon XY & Z. The anime has improved a lot, Ash is no longer the immature young kid, he seems (mentally) more as a teen now and yeah, I definitely think you should give it a try. When Ash went to challenge the Anystar Gym, he and his friends were attacked by one of Olympias assistant's [Carrie]. Ash battled her with Frogadier and Pikachu and won the battle. As she was about to use another Pokemon, Olympia stopped her in her tracks. Olympia's other assistant [Charlene] tells Carrie off for her actions towards the Ash and his friends. After they find out that Olympia is the gym leader of the Anystar gym, she has a vision of Frogadiers future. So they then go to gym and Olympia explains "Its power will become greater and greater". Then when Ash asked "Does that mean Frogadier will become Greninja? ", Olympia says "Umm, that.. I don't know. However I do know this it will reach new heights that no one has never seen before and the two of you will reach those new heights together". Professor Sycamore asked "Could you mean Mega Evolution? ", everyone gasp in surprise and Ash asked "Mega Evolution?". 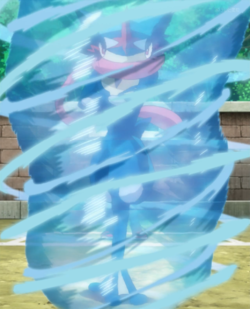 Professor Sycamore states "Though no one has ever seen a Greninja that could mega evolve". Clement says excitedly "That's incredible! A new power that no one has ever seen before is a really BIG deal!" Serena says "Not just a BIG deal it's a HUGE deal!" Bonnie cries out "I can't wait for that to happen" Then Ash says confidently to Frogadier "Then lets go the future is out there just waiting for use!" Ash' Greninja is a very important character in the XYZ series and it's when Ash and Greninja's emotions are in sync that Ash-Greninja appears. When Ash and his friends reunite with Sanpei and his Greninja, they all go to Sanpei's home, Ninja Village, and go over to Sanpei's room, then Dedenne and Squishy go down a trapdoor and Ash, Sanpei and the others follow and find themselves in a secret room. Sanpei's older brothers Ipai [the oldest] and Niai [the 2nd oldest] show Ash and his friends a temple with a picture of the ninja hero [A Greninja]. Bonnie states "But that Greninja is different then other Greninja I've seen before!" Clement said "Yeah, that's true"
Ash Greninja is a very special pokemon and one of a kind, but sadly Ash-Greninja has left Ash to get read of the rest of the vines in kalos. Ash Greninja's form requires them to be in sake and synchronized together, once he took full form the water shuriken on Greninja's back is a symbol of its strength which can mean that Ash and Greninja have a strong bond and makes them battle together as one.